VOLGA DREAM CRUISE IS A UNIQUE EXPERIENCE FOR A DISCRIMINATING TRAVELER. M/S Volga Dream is a boutique, luxury, family owned and operated riverboat. Intimate ship with only 100 passengers onboard is like a private club where all members share spacious open decks, inviting restaurants, bars, and other social spaces and pampered by a personalized attention of the crew members, selected and trained by the ship owner. Unlike other riverboats offering only onboard accommodations and moored on the outskirts of both cities, Volga Dream provides 5* centrally located hotels before and after the cruise in Moscow and St. Petersburg. It allows you to make the best of your free time: explore famous landmarks, attend evening performances and enjoy best restaurants. Thoughtfully decorated cabins and staterooms come with en suite bathrooms with separate shower, a/c, minibar, safe, satellite TV, access to hi-speed satellite Wi-Fi and many other facilities. Gourmet dining experience rivals the best restaurants and offers the best samples of Russian and European cuisine, prepared with love and expert attention of highly skilled chefs, complete with unlimited wine, soft drinks, freshly baked bread. 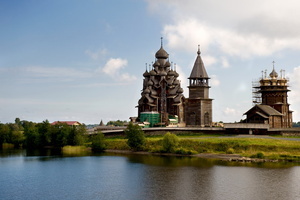 Each day is a unique opportunity to explore the grandeur of two capitals: Moscow and St. Petersburg and enchanting Russian countryside with its small fairy tale-like towns and villages. Shore excursions are led by professional expert guides and conducted in small groups with personalized attention to every group member. The size of the group is 25 people in Gold Program and 15 in the Platinum program. 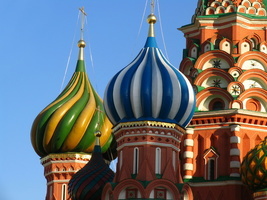 The ship ensures a fascinating opportunity to enrich your knowledge of Russian culture by offering cooking demonstrations, Russian language lessons, documentary films, Tchaikovsky and Rachmaninov piano concerts, matryoshka painting classes, Russian costumed dinner with vodka tasting and many other activities. Volga Dream PLATINUM caters to discerning travelers who prefer to travel privately or in an intimate group. This journey includes accommodation in the finest 5-star hotels in Moscow and St. Petersburg and extensive touring of the most breathtaking sites in small groups. Welcome to Russian river cruise onboard luxurious Volga Dream! You will be met at the airport and transfered to the deluxe hotel St. Regis Moscow Hotel Nikolskaya***** located in the historic city centre close to the Kremlin and Bolshoi Theatre. In the evening you will meet your guide who will wait for you in hotel lobby from 6pm to 9pm. Spend your day resting or exploring central Moscow on your own. Morning tour of Kremlin with a visit to the Armoury Museum where you will view the marvelous collection of coronation finery, hand-forged armour and weapons, royal carriages and sleighs, and dazzling Faberge eggs. The famous gems inlcuding Catherine the Great’s diamond-encrusted coronation crown and the 190-carat Orlov Diamond can be viewed in the Diamond Fund. 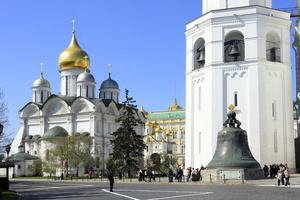 Proceed to Kremlin Square with famous cathedrals. 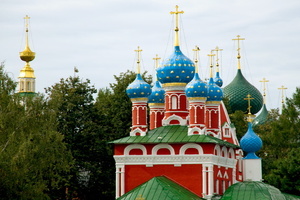 After breakfast enjoy an orientation city tour of Moscow followed by a visit to a famous Novodevichy Cemetery where prominent Russian cultural and political figures were laid to rest, among them Russian writers, musicians, playwrights, and poets, as well as famous actors, political leaders, and scientists. After lunch, visit a famous Museum of Cosmonautics and learn about Yury Gagarin’s first flight in the space and proceed to an outdoor Exhibition of Achievements of the People's Economy – a truly remarkable footprint of Soviet Architecture and design. 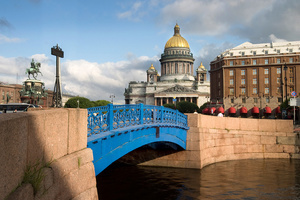 Arrive in St. Petersburg via the Neva River and disembark MS Volga Dream. Enjoy a city tour of St. Petersburg and after lunch visit Faberge museum which contains world's largest collection of works by Carl Faberge, including 9 Easter eggs commissioned by the Russian royal family. After the tour, check-in to the deluxe Grand Hotel Europe. This morning travel to Catherine the Great–s Palace, which houses the extraordinary Amber Room, its six tons of solid amber deftly carved and framed in gold leaf. Once deemed the –eighth wonder of the world,– the room was stripped by the Nazis in 1941, but majestically reconstructed in honour of St. Petersburg–s 300th birthday. 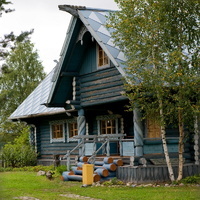 After lunch in Podvorie, a restaurant in a traditional Russian log house, on the way back to St. Petersburg visit a –Russia in Miniature– Interactive Museum. Done with a great care and attention to detail, this very realistic model of Russia will give you a great picture of this vast country full of stereotypes, generalizations and main attractions of every region. Volga Dream Cruise, We just came back from a cruise from St. Petersburg to Moscow with the "Volga Dream". The journey started from St. Petersburg. A very impressive city with lots to see in the city and also we were taken to Pushkinovo and Imperial palaces and also Peterhof. All our group liked the palaces very much. I didn't believe they were so breathtaking. Accomodation was on a ship, far from the city center, but no problem as city buses take you to the end of Nevski prospect or to the metro station. Bus and metro tickets are very cheap. The cruise strated in the evening of the fourth day and cruise took us 5 days. We thought it could be boring, but the activities on board were numerous and the time was flying very fast. The weather was good and we enjoyed small green islands or cities on the way : Yaroslavl, Goritsy, Mandrogi, Kizhi, Uglich. The sun was shining, so we spent a lot of time on the decks, enjoying beautiful landscapes. The time spent on the ship was nice and relaxing with musicians playing and singing live. Probably students, but very professional. The cabin was not as good as we had expected. It was nice and clean but too small. Toilet and shower also very small. The food was very good - a lot of vegetables like beets and cabbages. Souvenirs on board too expensive but we bought a few nice items in St. Petersburg and in Yaroslavl, so we didn't bother about the prices on board. To explore Moscow we had only a day and a half. Definitely too short time to see all the marvelous things in this splendid city. We decided to come to Moscow separately. I will definitely book a trip to Moscow through East West Tours - Nordic Saga, as they proved to be very sensitive to all our needs and expectations preparing for this trip. All in all, the trip was very good. We are very happy to have taken it. Many thanks to Dora from Nordic Saga , who was very helpful in all matters and gave us many valuable tips about this journey. Services highlighted in red are included only in the Platinum program!